Honor Bob Parry’s Legacy with a Donation Today! Exclusive: Cyber-criminal efforts to hack into U.S. government databases are epidemic, but this ugly reality is now being exploited to foist blame on Russia and fuel the New Cold War hysteria, reports Gareth Porter. Recent hearings by the Senate and House Intelligence Committees reflected the rising tide of Russian-election-hacking hysteria and contributed further to it. Both Democrats and Republicans on the two committees appeared to share the alarmist assumptions about Russian hacking, and the officials who testified did nothing to discourage the politicians. On June 21, Samuel Liles, acting director of the Intelligence and Analysis Office’s Cyber Division at the Department of Homeland Security, and Jeanette Manfra, acting deputy under secretary for cyber-security and communications, provided the main story line for the day in testimony before the Senate committee — that efforts to hack into election databases had been found in 21 states. Former DHS Secretary Jeh Johnson and FBI counter-intelligence chief Bill Priestap also endorsed the narrative of Russian government responsibility for the intrusions on voter registration databases. But none of those who testified offered any evidence to support this suspicion nor were they pushed to do so. And beneath the seemingly unanimous embrace of that narrative lies a very different story. The Department of Homeland Security (DHS) has a record of spreading false stories about alleged Russian hacking into U.S. infrastructure, such as the tale of a Russian intrusion into the Burlington, Vermont electrical utility in December 2016 that DHS later admitted was untrue. There was another bogus DHS story about Russia hacking into a Springfield, Illinois water pump in November 2011. So, there’s a pattern here. Plus, investigators, assessing the notion that Russia hacked into state electoral databases, rejected that suspicion as false months ago. Last September, Assistant Secretary of DHS for Cybersecurity Andy Ozment and state officials explained that the intrusions were not carried out by Russian intelligence but by criminal hackers seeking personal information to sell on the Internet. Both Ozment and state officials responsible for the state databases revealed that those databases have been the object of attempted intrusions for years. The FBI provided information to at least one state official indicating that the culprits in the hacking of the state’s voter registration database were cyber-criminals. Illinois is the one state where hackers succeeded in breaking into a voter registration database last summer. The crucial fact about the Illinois hacking, however, was that the hackers extracted personal information on roughly 90,000 registered voters, and that none of the information was expunged or altered. Ozment ‘s testimony provides the only credible motive for the large number of states found to have experienced what the intelligence community has called “scanning and probing” of computers to gain access to their electoral databases: the personal information involved – even e-mail addresses – is commercially valuable to the cybercriminal underworld. That same testimony also explains why so many more states reported evidence of attempts to hack their electoral databases last summer and fall. After hackers had gone after the Illinois and Arizona databases, Ozment said, DHS had provided assistance to many states in detecting attempts to hack their voter registration and other databases. And it’s not just state voter registration databases that cybercriminals are after, according to Menzel. “Every governmental data base – driver’s licenses, health care, you name it – has people trying to get into it,” he said. The sequence of events indicates that the main person behind the narrative of Russian hacking state election databases from the beginning was former FBI Director James Comey. In testimony to the House Judiciary Committee on Sept. 28, Comey suggested that the Russian government was behind efforts to penetrate voter databases, but never said so directly. Comey told the committee that FBI Counterintelligence was working to “understand just what mischief Russia is up to with regard to our elections.” Then he referred to “a variety of scanning activities” and “attempted intrusions” into election-related computers “beyond what we knew about in July and August,” encouraging the inference that it had been done by Russian agents. The media then suddenly found unnamed sources ready to accuse Russia of hacking election data even while admitting that they lacked evidence. The day after Comey’s testimony ABC headlined, “Russia Hacking Targeted Nearly Half of States’ Voter Registration Systems, Successfully Infiltrating 4.” The story itself revealed, however, that it was merely a suspicion held by “knowledgeable” sources. Similarly, NBC News headline announced, “Russians Hacked Two U.S. Voter Databases, Officials Say.” But those who actually read the story closely learned that in fact none of the unnamed sources it cited were actually attributing the hacking to the Russians. It didn’t take long for Democrats to turn the Comey teaser — and these anonymously sourced stories with misleading headlines about Russian database hacking — into an established fact. A few days later, the ranking Democrat on the House Intelligence Committee, Rep. Adam Schiff declared that there was “no doubt” Russia was behind the hacks on state electoral databases. But that claim of a “likely” link between the hackers and Russia was not only speculative but highly suspect. The authors of the DHS-ODNI report claimed the link was “supported by technical indicators from the U.S. intelligence community, DHS, FBI, the private sector and other entities.” They cited a list of hundreds of I.P. addresses and other such “indicators” used by hackers they called “Grizzly Steppe” who were supposedly linked to Russian intelligence. Then, on Jan. 6 came the “intelligence community assessment” – produced by selected analysts from CIA, FBI and National Security Agency and devoted almost entirely to the hacking of e-mail of the Democratic National Committee and Hillary Clinton’s campaign chairman John Podesta. But it included a statement that “Russian intelligence obtained and maintained access to elements of multiple state or local election boards.” Still, no evidence was evinced on this alleged link between the hackers and Russian intelligence. Over the following months, the narrative of hacked voter registration databases receded into the background as the drumbeat of media accounts about contacts between figures associated with the Trump campaign and Russians built to a crescendo, albeit without any actual evidence of collusion regarding the e-mail disclosures. But a June 5 story brought the voter-data story back into the headlines. The story, published by The Intercept, accepted at face value an NSA report dated May 5, 2017, that asserted Russia’s military intelligence agency, the GRU, had carried out a spear-phishing attack on a U.S. company providing election-related software and had sent e-mails with a malware-carrying word document to 122 addresses believed to be local government organizations. But the highly classified NSA report made no reference to any evidence supporting such an attribution. The absence of any hint of signals intelligence supporting its conclusion makes it clear that the NSA report was based on nothing more than the same kind of inconclusive “indicators” that had been used to establish the original narrative of Russians hacking electoral databases. So, the history of the U.S. government’s claim that Russian intelligence hacked into election databases reveals it to be a clear case of politically motivated analysis by the DHS and the Intelligence Community. Not only was the claim based on nothing more than inherently inconclusive technical indicators but no credible motive for Russian intelligence wanting personal information on registered voters was ever suggested. Russian intelligence certainly has an interest in acquiring intelligence related to the likely outcome of American elections, but it would make no sense for Russia’s spies to acquire personal voting information about 90,000 registered voters in Illinois. When FBI Counter-intelligence chief Priestap was asked at the June 21 hearing how Moscow might use such personal data, his tortured effort at an explanation clearly indicated that he was totally unprepared to answer the question. In contrast to that befuddled non-explanation, there is highly credible evidence that the FBI was well aware that the actual hackers in the cases of both Illinois and Arizona were motivated by the hope of personal gain. All the hyped political angst regarding the possible resettling of a few thousand Syrian refugees stands in stark contrast to the relative lack of congressional concern about the equally, if not more inherently problematic Visa Waiver Program (VWP). This longstanding, historically-proven dangerous, but little understood Department of Homeland Security (DHS)-administered program, allowed 21,231,396 foreign visitors from 38 countries to pass through U.S. ports of entry with minimal to no screening according to 2013 official records (the most recent data published). The numbers should give pause, since visitors admitted each year via the VWP are over 2,000 times greater than the “up to 10,000” Syrian refugees proposed a few months ago by President Barack Obama for eventual resettlement in the U.S. The number of VWP entrants is nearly 20,000 times greater than the 1,300 Syrians previously allowed into the U.S. since the conflict began over four years ago. The VWP program allows 300 times more foreign visitors into the U.S. than refugees from all countries combined. Of those entering under the VWP: 293,217 came from Belgium; 1,804,035 from France; and 512,299 from Sweden. Even before the more recent “Charlie Hebdo” and Nov. 13 attacks in Paris, it was known that the United Kingdom, France, Belgium and Sweden were emerging as home bases for Islamic extremists joining the Islamic State (also known as ISIL, ISIS or Daesh). So do these countries, among others in the waiver program, offer potentially easy access to the United States for some of their increasingly radicalized citizens now supporting known terrorist organizations? We suggested last year that the United States has a gaping hole in its DHS and Immigration and Customs Enforcement (ICE) monitoring. There had been little public discussion of the VWP, a program that 38 countries currently participate in. Participating countries agree to loosen travel restrictions in order to encourage tourism, trade and business travel. Before traveling to the U.S. by sea or air, VWP participants must fill out an Electronic System for Travel Authorization (ESTA) form online. It costs a modest $14 and assumes that the applicant is telling the truth about previous visa denials and run-ins with the law. Since November 2014, new information, including additional passport data, contact information, and potential names or aliases, is required. Once the applicant has the ESTA application completed, he/she needs no other paperwork other than a valid passport from one of the participating countries. Testifying before the Subcommittee on Border and Maritime Security, Committee on Homeland Security, in the U.S. House of Representatives, Bucci made it sound like a “robust screening process” but what we don’t know, what is critically missing from his rosy prognosis, is how many of the over 1.1 million terrorist suspects that have made it onto key “terrorist watch lists” can be conclusively identified by biometric data alone, as Bucci’s testimony suggests. Could it be more likely that the only real barrier to entrance to the United States is the Customs and Border Protection officer at the port of entry, who stamps the passport, with or without a few questions, and with little means of verification? Unless a match comes up with someone entered on the Terrorist Watch List or the no-fly list, the VWP traveler is free to enter for up to 90 days or vanish underground. 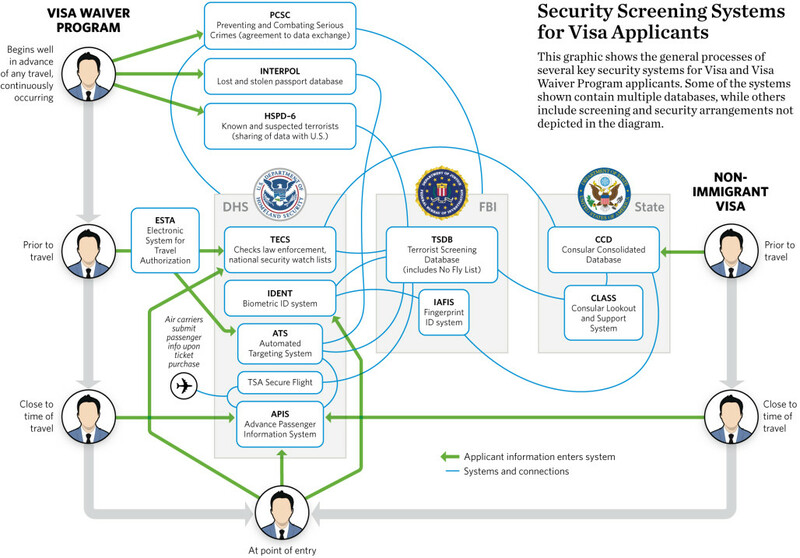 The Heritage Foundation director’s testimony included an impressively complicated chart (below) about how the VWP system is supposed to work, but the chart raises as many questions as it answers. It certainly doesn’t answer the most important questions about the actual effectiveness of the watch listing, checking and flagging process. The ESTA regulations also have gaping enforcement holes. In 2010 (the latest data available), 364,000 travelers were able to travel under the VWP program without even the minimum verified ESTA approval by airlines, according to the Government Accountability Office (GAO). No one knows to what extent these passengers presented a security risk or if they left the country after the required 90-day limit on their stays. Historically, it must be noted that Al Qaeda- aligned terrorists have already used the VWP to gain access to soft targets in the United States. French citizen and later convicted 9/11 participant Zacarias Moussaoui traveled on the VWP before he enrolled in Oklahoma and Minneapolis flight training schools prior to 9/11. Richard Reid, the “Shoebomber,” along with Ahmed Ajaj, also traveled on the VWP. In December 2001, Reid used an Amsterdam-issued British passport to board an American Airlines flight from Paris to Miami. In a separate incident, border agents caught Ajaj with bomb-making materials and a cheat sheet explaining how to lie to border officials. Ajaj was using a Swedish passport on the VWP. Despite the fact that both Youssef and Ajaj were caught in 1992 with numerous false passports, Youssef was not even detained, but was released in the U.S., and Ajaj was also later released. These egregious examples all occurred before or shortly after “9/11 changed everything.” Some of these problems were likely remedied, but no one knows if the post 9/11 collection and management of “big data” did not create new snafus. A 2004 OIG evaluation of the VWP still found significant problems and asked for reforms in 14 areas. One reform involved development of a process to check all Lost and Stolen Passport (LASP) data provided by participating VWP governments against entry and exit data in U.S. systems. In 2012, testimony to the GAO by Rebecca Gambler, Acting Director of Homeland Security and Justice, revealed that data is being collected by some VWP countries but not shared by any. 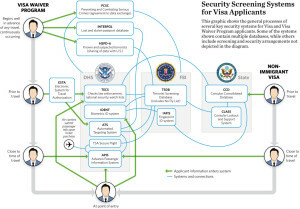 In July 2015, DHS, in collaboration with DOJ and the Department of State (DOS), completed PCSC Agreements, “or their equivalent with 35 (VWP) countries and two additional countries to share biographic and biometric information about potential terrorists and serious criminals.” The agreements are in place, but information is vague about data sharing. Would complete data sharing make a difference? Or are officials creating an even bigger haystack of unusable data? –Does the over-inclusiveness of mostly non-relevant, non-biometrically (and even non-biographically) identified data in the larger “total information awareness” primary U.S. and foreign agency databases, where trillions of pieces of metadata have been vacuumed and stored, help or hinder the accuracy of the complicated winnowing or “nomination” process to compile TIDE/TSDB and the “No Fly” and “Selectee” lists? Before Dec. 25, 2009, the Terrorist Screening Center (TSC) did not watch-list the “underwear bomber” Umar Farouk Abdulmutallab. Since he was not on the Terrorist Watch List (TSDB), he was allowed to board a flight to Detroit. The failure was never fully made clear, but getting on the list, it seems, is more art than science as it requires “nomination” from “originator” intelligence and law enforcement agencies possessing “reasonable suspicion” and biographical identifying info for the person nominated. The government counters — probably rightly — that it’s far better to tolerate the problem of “false positive” inaccurate listings than to err by not including a true “needle in the haystack” terrorist suspect. What’s left unsaid is the degree to which the list of 1.1 million persons is still under-inclusive as well as being over-inclusive. –We realize that the pre- and circa-9/11 examples of egregious failures now should be moot in light of the vast changes initiated in data-collection, data-mining and refining the watch listing processes after 9/11. These failures occurred before “Top Secret America” began vacuuming up trillions of pieces of data on people all over the world, including that done by the NSA’s massive communication interception programs; before TIDE or the no-fly list even existed. Congress needs to learn whether any of the recent participants in the Mideast or the European terrorist attacks could have used the waiver program to enter the U.S.
DHS and NCTC will invariably know the full answers to these important questions while the public must rely on reporters’ limited prying. In all fairness, it’s been reported that brothers Said and ChÃ©rif Kouachi, who shot 12 “Charlie Hebdo” employees, were on the U.S. terrorist watch list for years. One of the brothers was known to have traveled to Yemen, possibly for training with Al Qaida in the Arabian Peninsula. Also on the plus side, Reuters reported that four of the Nov. 13 attackers in Paris were listed in TIDE and at least one of the attackers was also on the U.S. no-fly list. Last week, the House of Representatives voted to tighten restrictions on the resettlement of Syrian refugees into the United States based on their concerns about national security. With a veto-proof majority, the bill passed 289-137 as Democrats joined Republicans, pointing to the fact that one of the participants in the Nov. 13 Paris attacks was a Syrian who entered Europe with a fake passport while posing as a refugee. The House bill requires that the FBI and Department of Homeland Security devise rigorous background checks on refugees, guaranteeing that they pose no threat. But the current process of so thoroughly vetting refugees can take years before approval, since it requires repeated interviews, applicants’ furnishing of full biometric data before traveling to the U.S. (in contrast to the VWP), and much more rigorous screening than merely checking terrorist watch lists. Further legislative restrictions would almost invariably prove so onerous as to effectively block almost all Syrian refugees from resettling in the U.S. In 2013, DHS recorded a total of 69,909 persons admitted to the United States as refugees. The leading countries of nationality for refugees were Iraq, Burma, and Bhutan. This is almost seven times the number of proposed Syrian refugees, but no one raised an eyebrow about these refugees. Of course, the bigger the haystack, the harder it is to find a terrorist. It is counter-intuitive to the “collect it all” mentality, yet whistleblowers, even before Edward Snowden, have been trying to make the public aware of the problems that inherently undercut the meaningfulness of “big data” gathering and analysis. “The problem with mass surveillance is when you collect everything, you understand nothing,” said Snowden, a former National Security Agency contractor. Data collection, even with biometric identifiers added, will inherently prove far less useful for predicting or preventing terrorism or any crime, than it will be in identifying a perpetrator, i.e., solving a crime, after the crime has been committed. That’s essentially how the FBI’s fingerprint repository works. A fingerprint identified one of the dead Paris attackers AFTER he died in the attack. Yet no one would accuse the fingerprint database of having failed. That is because, unlike the massive data collection undertaken after 9/11, no one ever claimed or justified the fingerprint repository as the ultimate solution that could detect criminals/terrorists and prevent would-be crimes/terrorist attacks before they happen. A similar realistic appreciation of the benefits, difficulties and vulnerabilities of terrorist watch listing based on big data collection, along with honest answers instead of government secrecy is necessary to justify continuation or possible expansion of the VWP. Definitions are in order to understand the meaning behind the numbers. A Refugee is a person who has been forced to leave their country in order to escape war, persecution or natural disaster. A legal permanent resident or “green card” recipient is defined by immigration law as a person who has been granted lawful permanent residence in the United States. Georgianne Nienaber is a regular contributor to the Huffington Post as well as regional and international publications. She is a member of the Society of Professional Journalists and Independent Reporters and Editors. 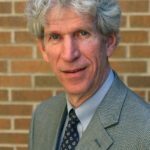 In May of 2002, the co-writer of this article and former FBI Agent and Minneapolis Division Legal Counsel, Coleen Rowley, brought some of the pre-9/11 security lapses to light and testified to the Senate Judiciary Committee about the endemic problems facing the FBI and the intelligence community.